Fund Source encourages our investors to do 2 things: first, get to know your risk profile and second, study the different mutual funds. b)Time horizon of your goals and needs - It helps to know our priorities and the timelines of our financial goals. It's typical that we have goals ranging from short, medium and long-term. There are mutual funds that can match these timelines. c)Your capacity to tolerate risk - You need to understand your threshold to handle possible fluctuations in the value of your investments. There are mutual funds that range from conservative to aggressive. This refers to the level of risk associated with each product type based on where the pooled funds are invested. There are no guaranteed returns in mutual funds. It is very important that you know where your money is invested and the risks that you are willing to take. d)Capacity to generate income & sources of cash flow - If you have regular source of income and can predict your cash flow, then you can also commit to a regular investment plan. But if your income is not regular, then you may need to exercise greater prudence in investing and consider your need for steady sources of cash during lean months. There are a good number of mutual funds in the market and the selection may be a challenging process. Fund Source makes it much easier & simpler by providing the Product Performance table (via COL Fund Source > Research page) which compares all the mutual funds available in Fund Source. There are 4 items that you may find useful as you choose the mutual funds to invest in. 1.Fund Source Risk Rating system - This is proprietary to Fund Source and carefully designed with the best intention of protecting the welfare of our investors. It is a numeric representation of a particular fund's risk level in terms of its historical returns. The rating is from 1 to 8 with 1 as the most conservative and 8 as the most aggressive. Clients are requested to take the short Client Suitability Assessment which determines the client's risk profile. It is designed to be a supplementary tool for our investors so that they are guided in making well-informed investment decisions. If the Client Suitability Assessment reveals that your risk profile is moderately conservative, then the ideal mutual funds for you are those in Money Market Funds and Bond Funds categories. If you wish to buy any of our Balanced Funds or Equity Funds, we will request you to approve a short waiver acknowledging that you are aware that you will invest in funds that are outside of your risk profile. The waiver will appear automatically when you choose any funds that are outside of your risk profile. It only needs to be approved once and this gives you access to all the mutual funds. 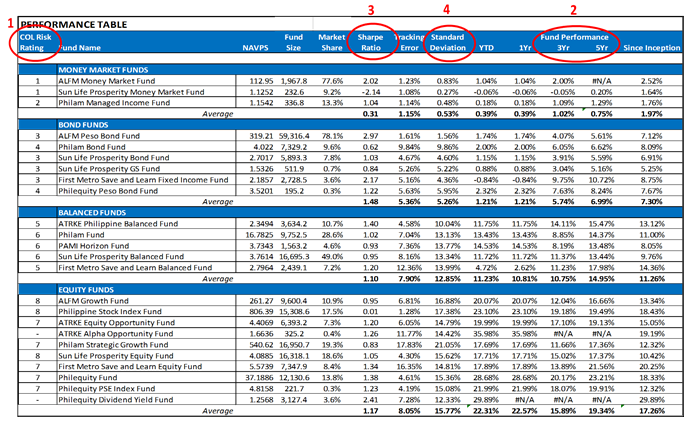 2.Fund Performance - The Fund Source Research team has compiled the performance of all the mutual funds available in Fund Source covering 4 periods, namely: Year-to-Date (YTD), 1 year, 3 years and 5 years. Investors may readily compare the historical performance of each fund. 3.Sharpe Ratio - The Fund Source Research team computes the Sharpe Ratio of each fund every month. This is a measure of a fund's excess return per unit of risk it has taken. The higher the Sharpe ratio, the better. 4.Standard Deviation - This is computed every month by the Fund Source Research team. This is a measure of the volatility of the fund's historical returns versus its average. A lower standard deviation generally implies lower risk. COL Financial also offers Investor Education seminars that you may attend to further help you discover more investment opportunities that are available. Please click here to check out the different seminars.